Vous ne voudrez pas quitter cette station comme à la maison! Eh bien peut-être d'aller pour une promenade en bateau. Cette maison est idéalement situé près de l'île de Sanibel, à seulement quelques minutes au shopping, Outlet Mall, salle à manger et une partie de Sud Ouest Florides plus belles plages. Cette chambre 2 maison dispose de waterviews de chaque pièce. La suite principale dispose d'un lit king size, la deuxième chambre a un lit queen size. Il ya une pleine taille canapé dans le salon. Il ya une piscine creusée magnifique wih cascades vedette et un bain à remous pour 6 personnes. Il ya un grand barbecue pour les barbecues, une véranda projeté, d'un patio à ciel ouvert et de magnifiques jardins autour de la propriété. La cour arrière est entourée d'eau et est littéralement un jet de pierre de la rivière Caloosahatchee et à quelques minutes dans le golfe du Mexique. Il ya un «quai 30 pour votre bateau inclus dans le prix de location. Vous pouvez louer des bateaux à proximité si vous ne avez pas votre propre. Bord de l'eau, accès du Golfe, du Dock, Creusée Piscine chauffée, bain à remous, projeté Lanai, grand barbecue à gaz, grand manger dans Kithcen, Repas en plein air La cuisine a des appareils en acier inoxydable. Un réfrigérateur côte à côte avec distributeur de glaçons et de l'eau à travers la porte, cuisinière, lave-vaisselle et micro-ondes. Tous les petits appareils que vous auriez besoin, mixeur, mixer, et grille-pain. Il a verres, plats, pots et casseroles, ustensiles de cuisine de l'argenterie et des torchons. La buanderie a une laveuse et sécheuse disponibles. Les chaises de plage, et une glacière. Câble Internet sans fil La maison est carrelé. La chambre principale dispose d'une salle de bains principale tv et attenante. Le salon dispose d'une télévision 42 'HD. Un lecteur de DVD disponibles pour votre plaisir. Tous les draps et serviettes sont fournis. barbecue, table et chaises de patio, et une table de véranda et des chaises sont disponibles pour vos besoins de restauration. We stayed at this home for 7 nights in early March 2019. The location is very convenient. 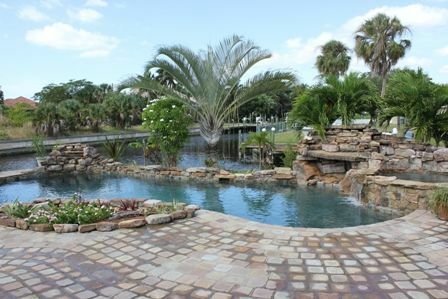 We enjoyed the lanai and beautiful backyard with a pool and canal access. The house itself is dated and can use some upgrades (ex: the front door only closes with a hard and loud push, the back bathroom toilet only flushed occasionally, there is a moldy smell, etc). The beds are so uncomfortable that we had back aches after only one night. The owner contacted us via email prior to our arrival and provided a detailed message that was very helpful. We had one question during our stay and she responded promptly. Overall, we rate our experience 3 out of 5 due to the need for new mattresses and many upgrades to the interior of the home. Great location but needs updating. Expected more for our money! Iona Shores is a great location with easy access, both by land and water, to all the activities Fort Myers has to offer. The house, though the layout is great, needs some updating. We had some issues with the pool/hot tub and some plumbing issues but with calls to Vickie they were resolved. Lack of outdoor lighting inhibited our enjoyment of the outside space in the evenings as in February it is dark by 6P. The dock area was littered with remnants from an old shore station that we were told a hurricane damaged. This made it impossible to safely dock our boat where the lowered seawall would make in and out of the boat easier. Though there was still room to tie our boat off along the seawall. Bedding, towels and rugs/bath mats were worn and dingy. Only one TV worked, the cable stations were minimal but the internet was good. This could be such a lovely property with a little TLC! We would love to stay here again if improvements are made, we loved the location. Although I will admit my home could use some updates, the other items you addressed are not quite accurate. Larry was a non stop complainer, from telling me the home appeared old upon arrival. To complaining about a rusty bolt holding down the toilet. (The cap that covers it had gone missing) He demanded I have the bolt replaced because his kids were coming and did not want to have issues with the toilet. I am sure a rusty bolt doesn’t keep a toilet from flushing. I did have to replace a shower valve. I also replaced the bolt on the toilet which the plumber thought was ludicrous. It was replaced within hours of his call. Larry had an issue with the pool skimmers and the heat in the pool. He was intense with his calls and his no it all attitude. He was explaining to me what needed to be fixed on my pool. I finally gave him the number to my pool man because he wouldn’t stop calling me and the issue he had did not make sense to me. My pool man came out 5 times, the 5th time to do what Larry asked, although it want necessary. I questioned my pool man and he said he felt it was the only way to get Larry to stop calling him. There is outdoor lighting on my lanai, outside beside the dining table and the very back slider to illuminate the pool area. The lights inside the pool I disconnected years ago because to fix them properly I would need to open the side of my pool and the reseal. This could possibly cause my pool to leak. I’d rather forgo lights then deal with the expense of opening the pool wall nor deal with the issue of a leaking pool. I had explained this to Larry. The dock area is not littered with an old shore station. I explained to Larry befor arriving I no longer had a boat lift or a dock as it had been destroyed by hurricanes Maria and I had no intentions of putting in a new dock soon. There are 2 piling about 9feet from my sea wall. I did not remove them because there is nothing wrong with them and if and when I decide to put in a new lift I will not need to have the expense of replacing what isn’t damaged. My sea wall is the same height around my entire property, which you can see from the pictures in my listing. There is no lower area that he mentions. As far as the towels and rugs I buy new towels each season in November. We really enjoyed the beautiful pool and screen porch area! Nice location on canal!